But it’s time for tha new plan, BAM! It is famously the city where the Russian president served as a KGB spy. It belongs to former East Germany, where people who know better see Russia with more sympathy than in the West. Towards the end of WW2 it suffered and learned at first hand how bad the Allies’ goodies were. Now Dresden seems to have a thing about Vladimir Vladimirovich and his conservative ideals. Already end of August, a mass rally against Merkel’s confrontation with Russia took place in Dresden. Crowds were not shy of shouting Kriegstreiber at her, hence calling a warmonger a warmonger. This week, Dresdeners who care are at it again. They have taken to the streets – peacefully, as this is no colorful revolution – in defense of Christian values, and against the threat of Islamization. The protesters call themselves PEGIDA, a German acronym for“Patriotic Europeans against [Gegen, in German] the Islamization of the West [Abendlandes, in German]. Their Facebook page already has 72,000 Likes. 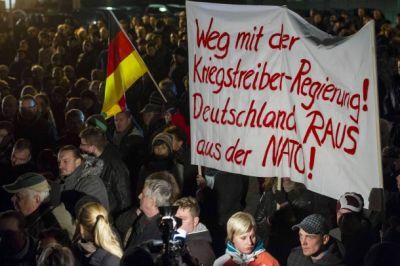 To the horror of the FAZ, Dresden street protesters, like the poor people of Haiti, carried a couple of placards that read “Putin help us”, “Away from warmongering governments – Germany out of NATO”. 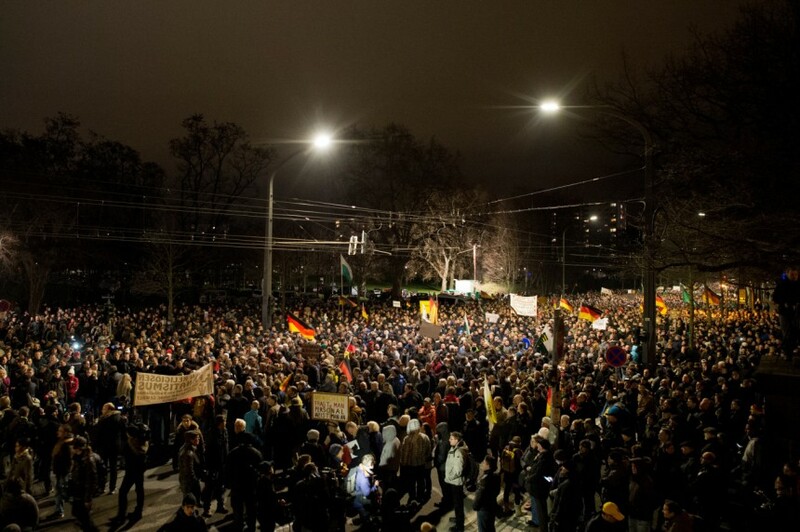 The protest started on Monday evening, Dec 15, and it is making headlines in Germany. According to the FAZ “more and more people are joining the PEGIDA protesters”.So far 15,000 and rising. That people in Germany might embrace conservative ideals at odds with the NWO agenda – the latter overlayed by deathly globalization, dilution of national culture, preeminence of economy over humanity, and of finance over industry – just doesn’t cross the mind of establishment German analyst. Either you agree with them or you are “poor” and “in fear.” And on top of that you are a brain-dead lover of Putin, as many in Dresden most certainly are. Interestingly PEGIDA has links to AFD, Alternative für Deutschland, Germany’s new far right – ardently patriotic – euro-skeptic party. Founded in February 2013, it immediately won 2 million votes, or almost 5% in the parliamentary elections. Then in 2014, AFD made it into the regional parliaments of three former East German regions: Brandeburg, Saxony and Thuringia. PEGIDA cannot be simplistically dismissed as a “symptom of povery and fear” the way our scared Der Spiegel does. Where is the connection between the anti-NATO and pro-Russia placards with poverty and fear? There is non beyond lazy mass media cynicism. PEGIDA, just like ADF, just like Die Linke at the other extreme of the spectrum, are symptoms of the German people’s growing antagonism toward traitorous policy making. The major parties all resemble one another; they care nothing for the popular will, necessities and the national interest which includes Germany’s still cherished Christian identity. The obscene pay and perks for TDs and Senators. . . There’s no recession in Lenster House. Enda Kenny asked a Garda last week if he felt he was immune from cuts. These are the pay and perks that Enda Kenny and the other 225 members of Leinster House receive. 35 – TDs and senators contribute 6% of their salary a year for up to a maximum of 20 years in order to benefit from the Dail pension scheme. It is a final salary scheme which allows for a maximum of ½ the final salary to be paid for life from aged 65 – 1/40th of final salary is accrued for each year of service. It provides for a lump sum upon retirement and it is possible to take early retirement from age 50. 37 – Dual abode allowance: This applies to ministers only and allows Ministers to claim tax deductions on mortgages, rental or hotel accommodation PLUS tax deductions for maintaining property and other expenses which can be up to €6,500. 38 – Ministers can claim a tax deduction on the interest on any loan required to purchase a second residence. 40 – Ministers can claim the entire cost of rental accommodation if their second residence is rented. 41 – Ministers can claim a tax deduction on the cost of maintaining a second rented residence. 43 – If Ministers use a hotel or guest house as a second residence they an claim for the entire cost IN ADDITION to €72.66 for subsistence. € 41,152 per annum each for the 18 independent TDs (Stephen Donnelly, Luke Flanagan, Mick Wallace, Shane Ross, Thomas Pringle, Michael Healy-Rae, Michael Lowry, Finian McGrath, Mattie McGrath, Tom Fleming, Noel Grealish, John Halligan, Catherine Murphy, Maureen O’Sullivan PLUS four TDs who have had the party whip removed Tommy Broughan, Willie Penrose, Denis Naughten and Patrick Nulty ). € 23,388 for 11 independent senators (John Crown, David Norris, Sean Barrett, Martin McAleese, Feargal Quinn, Ronan Mullen, Fiach Mac Conghail, Marie-Louise O’Donnell, Jillian van Turnhout, Katherine Zappone, Mary Ann O’Brien. These are due to of a lump sum upon termination PLUS a monthly payment for up to a year. As long as you have at least six months service in either the Dail or Seanad, you get a termination payment of two months salary. The monthly payment depends on how many years you’ve been a TD or senator eg for five years, you get three months at 75% of your salary. If you have over 14 years service, then you’d be entitled to 6 months at 75% of salary plus the following six months at 50% of salary. 50 – Each minister and minister of state, except An Taoiseach, An Tanaiste and justice minister, is entitled to recruit two drivers apiece at a cost which is charged to each department. 59 – Postage: – 1,500 free postage items per month for TDs and 1,000 for senators. 66 – Free car insurance.